Essential IT Skills Level 3 on vision2learn for schools leads to the new Information Technology Qualification ITQ in IT User Skills at Level 3. This nationally recognised qualification is designed to help pupils bridge the gap from KS4 to sixth form - another way to cope with RPA policy. 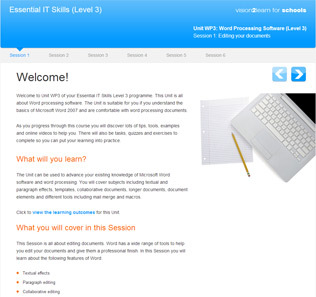 Essential IT Skills Level 3 is suitable for sixth form learners aged between 16 and 18. The units are flexible and can be combined to create a Level 3 Award or Certificate qualification, depending on the needs of the individual learner. Each ITQ unit has a credit value. To achieve the Level 3 Award in IT User Skills, learners need to achieve a total of 12 credits. At least 8 of these credits must be achieved at Level 3. To achieve the Level 3 Certificate in IT User Skills, learners need to achieve a total of 25 credits. At least 15 of these credits must be achieved at Level 3. This course will give learners the opportunity to gain a total of 17 credits at Level 3, which would be enough to achieve the Level 3 Award. To achieve a Level 3 Certificate, learners would need to also gain 8 further credits by studying some of our Level 2 ITQ units. Plan, select and use appropriate IT systems and software for different purposes. Evaluate the selection and use of IT tools to make sure that activities are successful. Devise solutions to improve the use of IT tools and systems for self and others. Registration and certification fees vary. Please see our in depth information sheet for details.